Protein phosphorylation analysis is more and more used for cell signaling studies. This post-translational modification regulates the function of numerous proteins in both physiological and disease-related conditions. Phospho-proteins can be easily monitored by using phospho-specific antibodies in various types of immuno-assays (Western blot, antibody array, phospho-ELISA…). However, data generated is reliable only if used from cell or tissue lysates that effectively reflect the phosphorylation state of initial samples. For this, optimal cell lysis buffers preserving phosphorylation status and protein stabilty are crucial. Leaving and handling samples on ice or at 4°C. Using “fresh” buffers containing detergents supplemented with protease and phosphatase inhibitors (RIPA buffer, NP40 buffer, protease and phosphatase inhibitors, cocktails of inhibitors…). Alternative solutions have been specially developed for the extraction of phosphorylated proteins from neuronal, soft tissues types and cell lines (1, 2). Such ready-to-dilute (RTD) buffers, like the BioSensis’ Phospho-Sure™ Buffer, extract the phosphoproteins in a native state without the use of harsh detergents or oxidizers. It also helps maintain phosphoproteins and protect them from degradation better than traditional detergent based extraction buffers. Phospho-Sure™ RTD is designed as both an isolation and extraction buffer. For best results, the intact tissue should be also bathed in ice-cold Phospho-Sure™ buffer during excision of the tissue. Once the desired tissue piece is isolated, it may be transferred to a small volume of ice-cold Phospho-Sure™ for disruption. Want to preserve phospho-proteins for Western blot and Antibody array protocols? Phospho-Sure™ RTD™ Neuronal Cell & Soft Tissue Extraction Buffer is very convenient to use. Simply add sterile ddH2O directly to the powdered solution in the supplied bottle (100- or 200-ml format), swirl briefly to dissolve the chemicals and use. The material contains no preservatives so sterile technique should always be used. 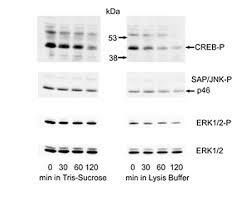 Western blots of CREB-P, SAP/JNK-P, ERK1/2-P and ERK1/2 from adult guinea pig central nucleus of the inferior colliculus (ICc)/ Samples were homogenized in Phospho-Sure™ RTD™ or traditional Tris-HCL triton X-100 lysis buffer and kept on ice for up to 120 min. Aliquots of the homogenates (30µg protein), were run on SDS-PAGE. Separated proteins were electrophoretically transferred to the blotting membrane, which was incubated with anti-CREB-P antibody. The blot was stripped and treated with anti-SAP/JNK-P, ERK1/2-P or ERK1/2 antibodies. Photo courtesy of Suneja et al., Journal of Neuroscience Methods 150 (2006) 238-241). “Phospho-Sure™ Buffer helped to get strong, clear bands as published in the paper”. “Very satisfied with the performance of the buffer to stabilize samples”.